One Touch Can Opener is the ultimate can opener. Ever had the trouble with opening cans, some cans are easy to open but some just difficult. The one touch opener will open, leave a clean edge and simply lift without too much effort. It is compact and uses 2 AA batteries. To read more about One Touch Opener Reviews see below. 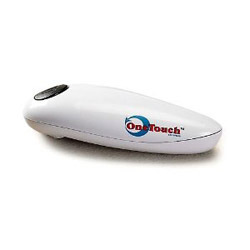 With your help we can reach more people and let them know about One Touch Can Opener whether this product works or not. As I write this my One Touch is locked on a dented can and I have tried everything in the manual to get it off. I have also cut myself twice on the sharp edges, did not think about that. I bought it because I had hand surgery and it does work well, though not one touch, I usually have to push the button 2-3 times to get it started. its an amazing product. my mom loves it. she has arthritis and its so much easier on the wrist. i recommend this product. It worked great...as long as the cans are not dented. I like buying clearance items so the cans are mostly dented. I still have to rely on the good old fashioned can opener. I've used this product for a while now. It works great on most cans, but I have found some that it won't open. And it come sometimes be very difficult to remove from the can when the batteries are low. It is definitely worth trying, but not quite perfect. I've had mine for 4 years. Also, I am only on my second set of batteries only after 3 years. As far as the opener stopping in the middle of the opening process, I have never experienced that. I did have to learn that after it is through going around full circle, you have to wait a few second before it shuts off completly and releases. Love it! I really like the opener. The only thing is that it does have a sharp edge. The top comes off and the can has a razor sharp top. I am just careful, because it makes my life easier. I hate this product. The batteries don't last long enough to open a can,and when the opener stopped in the middle of opening a can, I almost cut my finger off trying to get the stupid thing to release. I think this product is dangerous and would never recommend it to anyone. Finally, something that really works!!! I have bought more can openers, of all different configurations, that I want to admit...but thanks to the suggestion of my niece, I bought this one. What a fantastic product. Not only does it do exactly what it is supposed to do, it is fun to watch it dance neatly around the top of the can. I have arthritis in both hands and this little opener has made my life much easier. All you need to do is keep a good supply of batteries and off you go! Love it!!! I bought this at Target because it promised to eliminate the sharp edges. It works exactly as described. Easy enough and safe enough for my kids to use when they're "helping" me in the kitchen. Congee is right about the paper that it peels off of the can. Battery life is even great. Original batteries lasted me about a year. Overall an excellent can opener and well worth every penny. I bought this can opener after slicing my finger open on a can I opened with a regular can opener. I just love it. It takes the whole top off with no sharp edges. It certainly is easy to use and does open cans cleanly. It might peel off some of the paper lining outside the can as it cuts through the top of the can, so make sure you don't accidentally eat that. I can't even imagine going back to another can opener. Small enough to put in a drawer which takes less space. It's so simple to use and I love the clean smooth edges it leaves. It's a must for every household. I purchased this can opener because of the arthritis in my hands and don't have the necessary space for a wall mounted one. This is wonderful..works so good. You set it on the can and you can walk away to do something else while it is opening the can. This is a handy item to have around the house...you won't regret getting this one.